Lunch in a Marrakesh home - We spent a delightful afternoon at lunch in the beautiful Marrakesh home of this woman. Urbane and articulate, she speaks several languages. Here, she is explaining her adventures in cooking to us -- her "tangine" was the best I tasted in Morocco. The walls of Old Marrakesh - The wall that completely encircles the medina of Marrakesh is 900 years old and stretches for 12 miles. 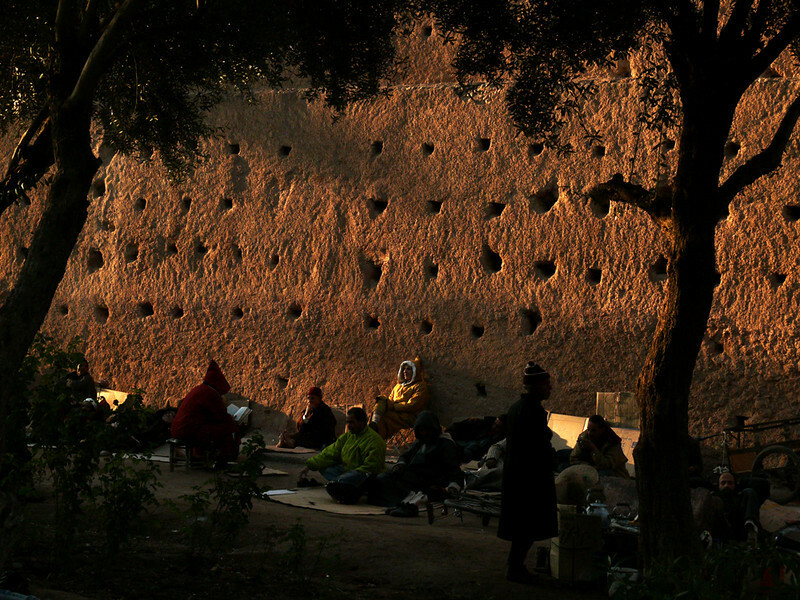 I found this group of men resting and reading at the base of this wall as dusk approached. Caleche, Marrakesh - Everyone who visits Marrakesh should spend at least a half day seeing the city from a caleche. 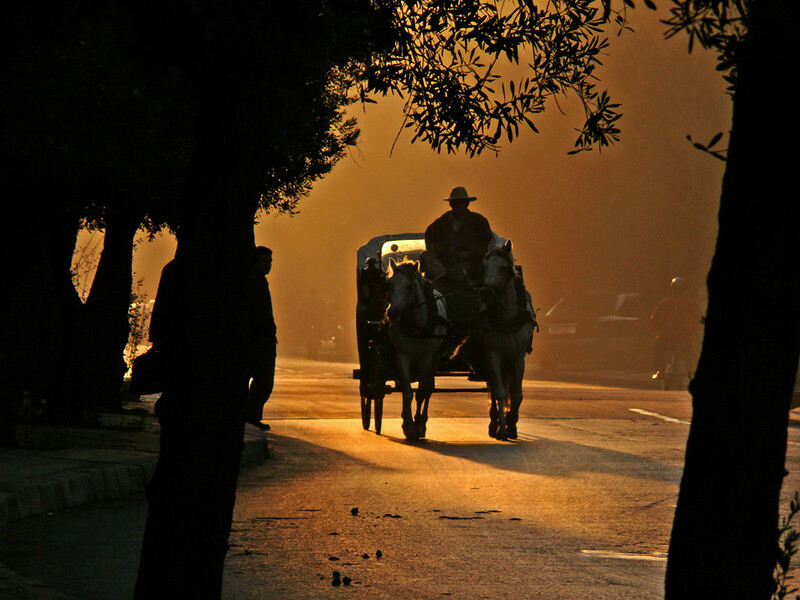 These horse drawn carriages are a Marrakesh tradition and seem to fit quite naturally into the old streets of the city. Tea Time, Attaouia Market - One of the largest markets in Morocco is held weekly in Attaouia, about an hour from Marrakesh. Everything from clothing to camels is sold and swapped here. 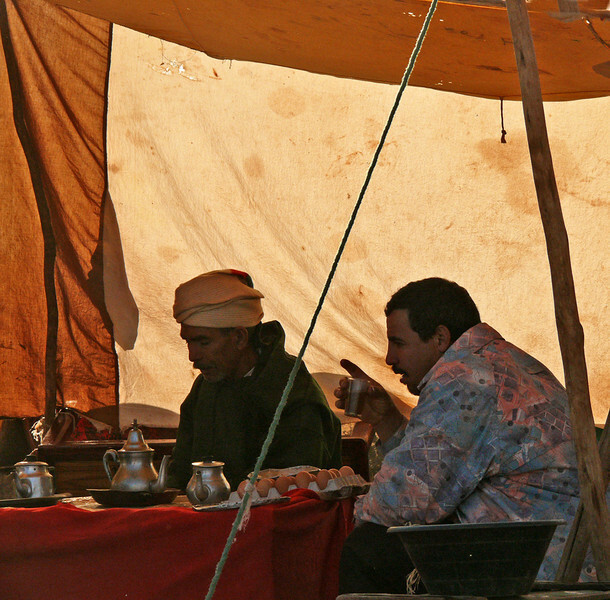 I made this image of two fellows talking business in a tent over a cup of tea in the heart of the market. 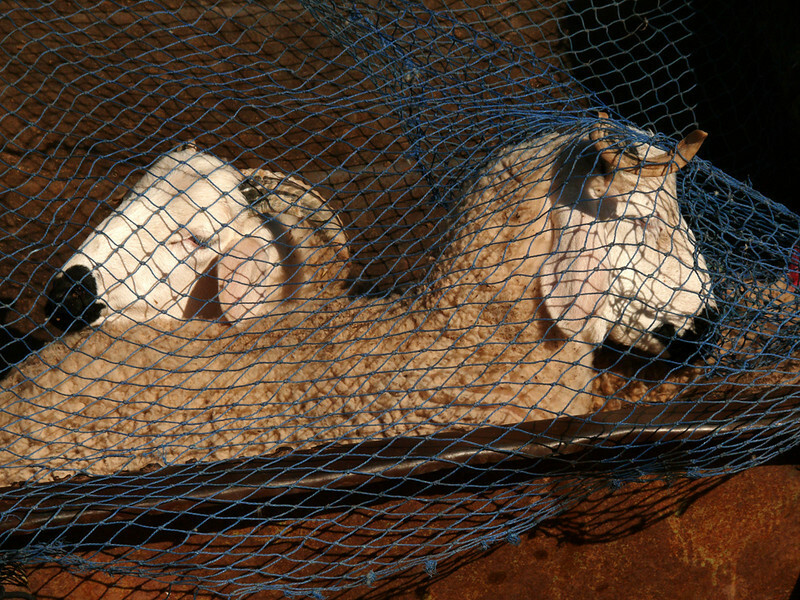 Doomed rams, Attaouia Market - The Sacrifice of the Ram is a national Islamic holiday in Morocco. At year's end, every family buys a ram and then sacrifices it as part of a religious tradition. We were at the Attaouia Market only a few days before the holiday and saw many rams being brought and sold. This pair has probably been already purchased and are being stored under a net in the back of a truck. They have no idea their days are numbered. Corner shop, Marrakesh - A shopkeeper in Marrakesh’s medina opens for business as another day begins. Like many of the shops in this teeming markeplace, hers is a street stall. The interior is filled with her goods – she will sell them to passers by in the street. She has chosen a key location. Her little store is on a corner, just across the street from the wide open door of one of the only public toilets in the neighborhood. 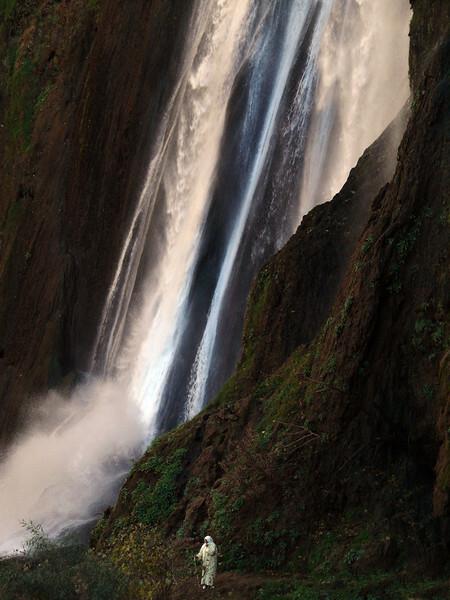 Cascades d'Ouzoud - One of the most spectacular sights in Morocco, this waterfall plunges 328 feet off a series of rocky ledges into the Canyon of Wadi e-Abid. It is about 100 miles from Marrakesh. 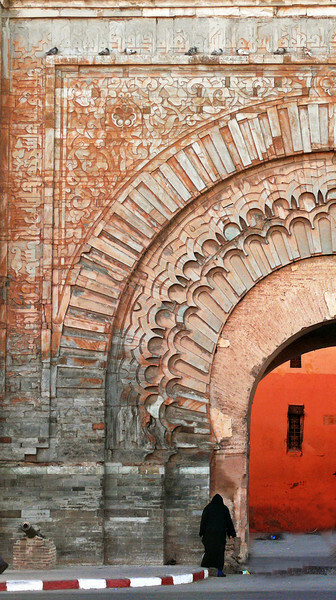 Bab Agnaou, Marrakesh - The most beautiful gate in the ramparts of Marrakesh, this 900 year old arch once led to the Royal Palace. Its carved sandstone still shows tinges of red, melding with grayish blue. The sculpted facade consists of alternating layers of stone and brick. 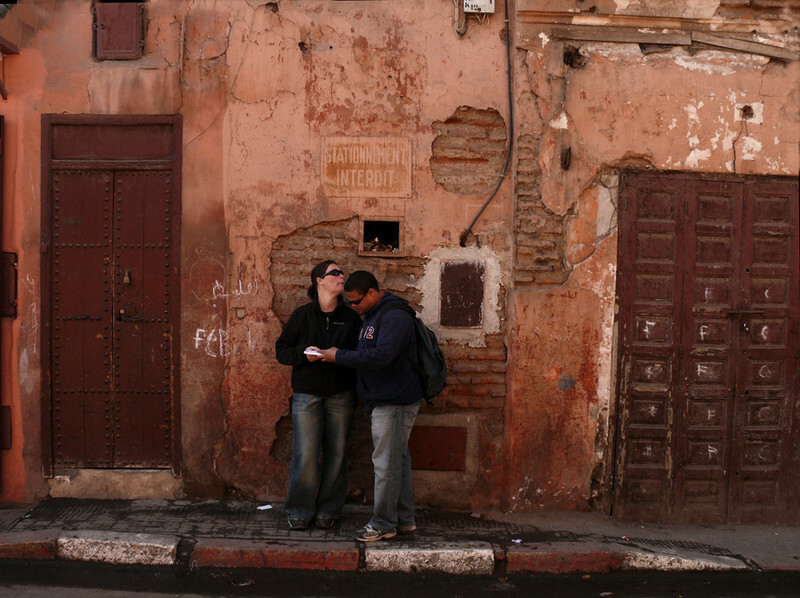 Haggling in the souks of Marrakesh - Haggling is an art form in Marrakesh. You generally offer one third of the asking price and if not successful, you walk away. 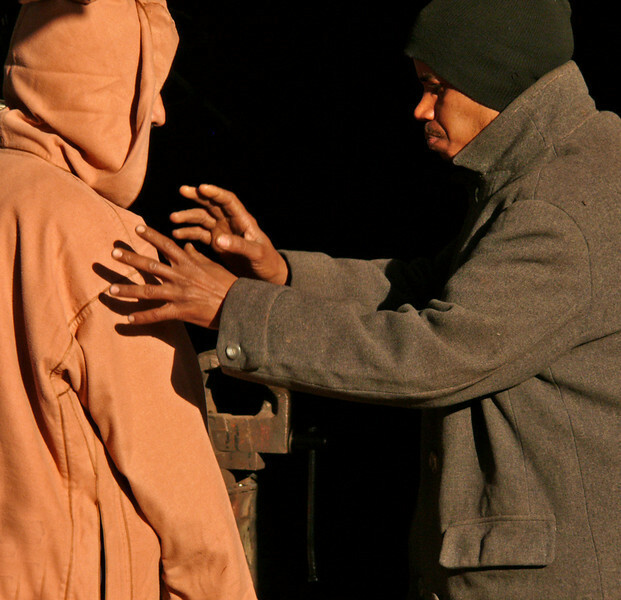 Often, the seller will come after you with a counter offer. No matter how low the price, the seller usually wins in Marrakesh. Dinner's coming, Marrakesh - These people rushed past me so quickly I never saw what they were carrying until I looked at the picture. It appears as if they are bringing a dish of food to family or friends. 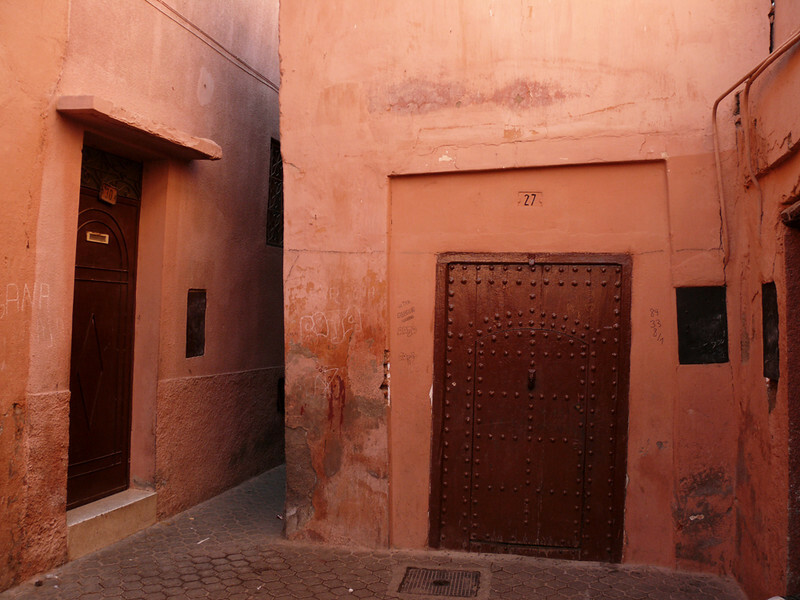 Tilted doors, Marrakesh - Some of the structures in Marrakesh's ancient medina have settled over the years, tilting the frames surrounding the doors. Hands full of questions, Marrakesh - After making this image in the souks of Marrakesh's medina, I had more questions in mind than answers. Is this woman deep in thought? Or is she about to sneeze? Or perhaps a quick prayer is being offered? Her hands are stained red. Has she been working with dyes or food, or is it decorative henna? The more questions a picture asks, the more thought provoking it is. 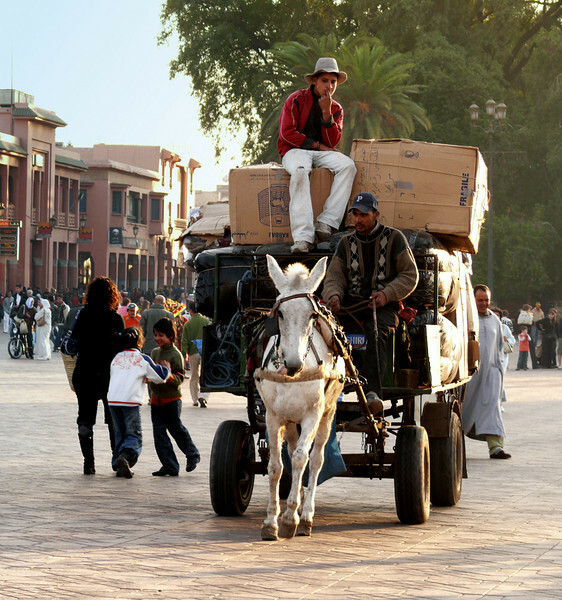 Horseplay, Place Jemaa el-Fna, Marrakesh - This square is at the heart to Marrakesh. It teems with life. I was photographing this overloaded wagon as it rumbled across the square towards me. Suddenly, two children, who had been walking behind their mother, began to spontaneously play with each other. They look as if they could be dancing, but they are really engaged in a game of push and shove behind their mother’s back. They don’t even acknowledge the huge wagon passing only a few feet away from them. They have their own horseplay to oonsider. 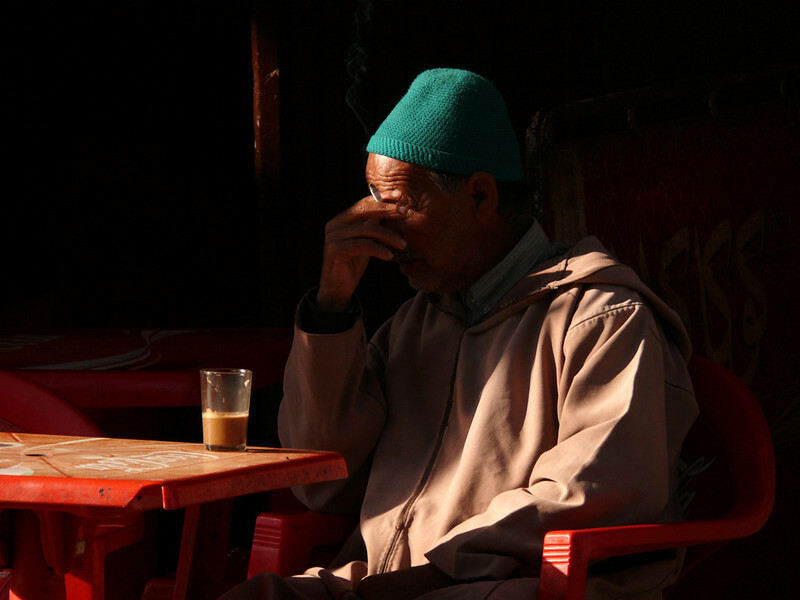 Study in light, Marrakesh - I saw the light and shadow falling on this man as he sat before his tea in a Marrakesh cafe. Once again, it is left to us to answer the questions this image asks. Is he deep in thought? Tired? Lost in sadness? Or just hiding from my camera? Lost in Marrakesh. 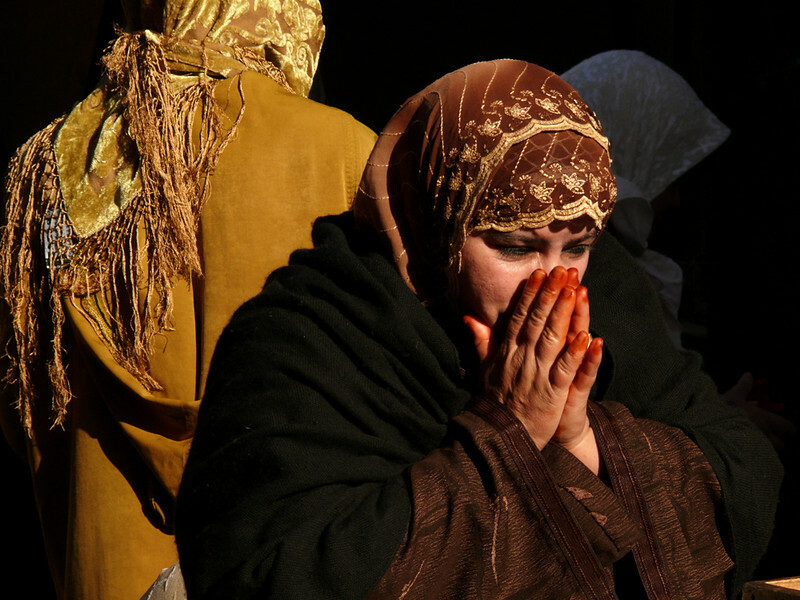 - It is very easy to lose yourself in Marrakesh. The streets are usually not marked, and if they are, the signs are in Arabic. Maps are useless. Most of the smaller streets in its vast medina are not shown on them. These tourists may never find what they are looking for. But chances are they will find something else that is just as fascinating. 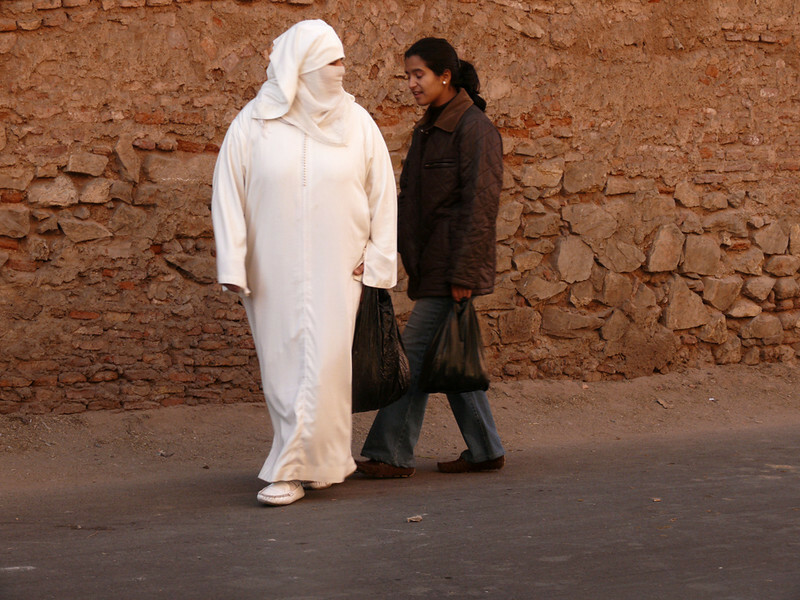 Woman in white, Marrakesh - I did not see many women wearing the characteristic white haik in Marrakesh. It is more often seen in places such as Essaouira. Both of these women carry plastic sacks, a sure sign that they have been shopping. 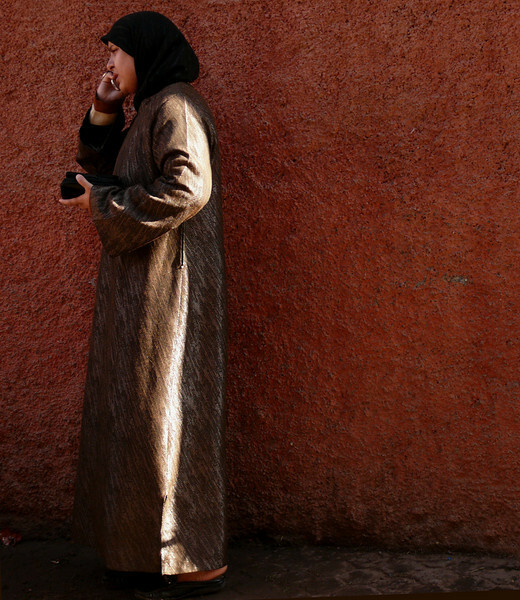 Sliver of light, Marrakesh - She stands before a wall in Marrakesh’s old walled city, a study in contrasts. A sliver of morning light slips between two buildings to illuminate just the edge of her garment. The rough texture of her clothing echoes the heavily textured wall behind her. Without the cell phone, this photo could have been made a century ago, with very few differences. In the heart of the souk, Marrakesh - Originally located on the Saharan trade routes, Marrakesh was a convenient staging post for caravans and developed into a major craft and trading center. Today, its souks carry on the trading tradition. 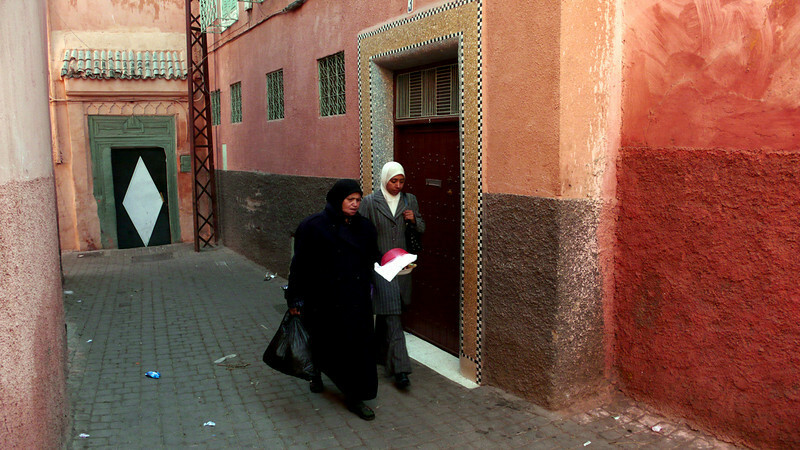 The medina is an intricate maze of narrow streets, often protected from the sun by slated awnings. 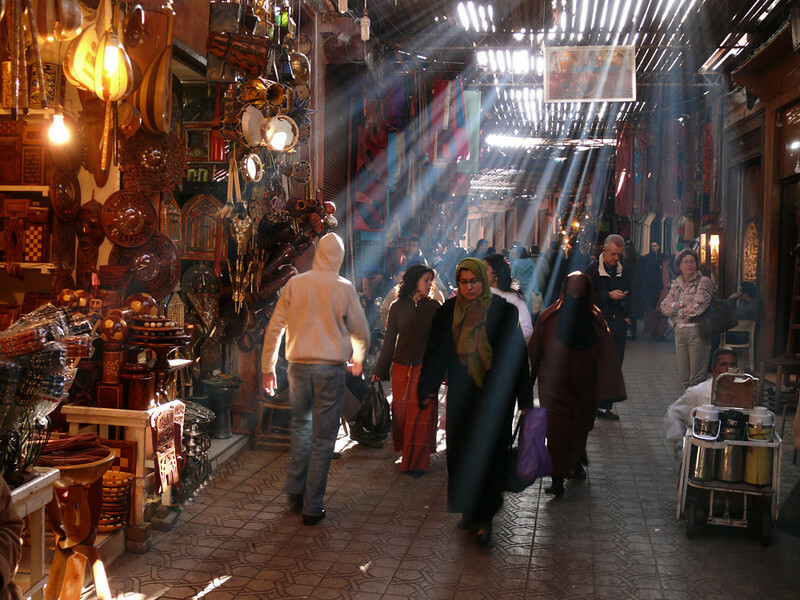 By mid morning, the Souk Smarine, the busiest street in the souks, is ablaze in shafts of light. 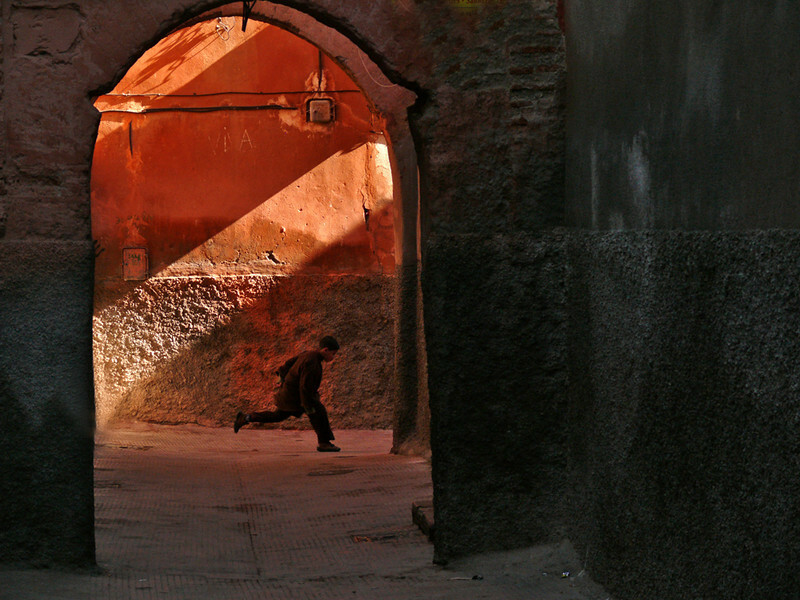 Decisive moment, Marrakesh - This is a very special photograph, a spontaneous moment of pleasure caught in a very Moroccan environment. I was walking through the souks of Marrakesh when I saw a shaft of sunlight illuminating an ancient wall within an archway at the end of a dark and narrow street. I heard the distant voices of children at play, getting closer and closer. I framed the shot and waited, and within a few seconds a kid came flying into the arch. I squeezed the shutter button and caught him just as he landed. The magic of photography will always keep him in this spot, framed in fiery red, a symbol of youthful exuberance. 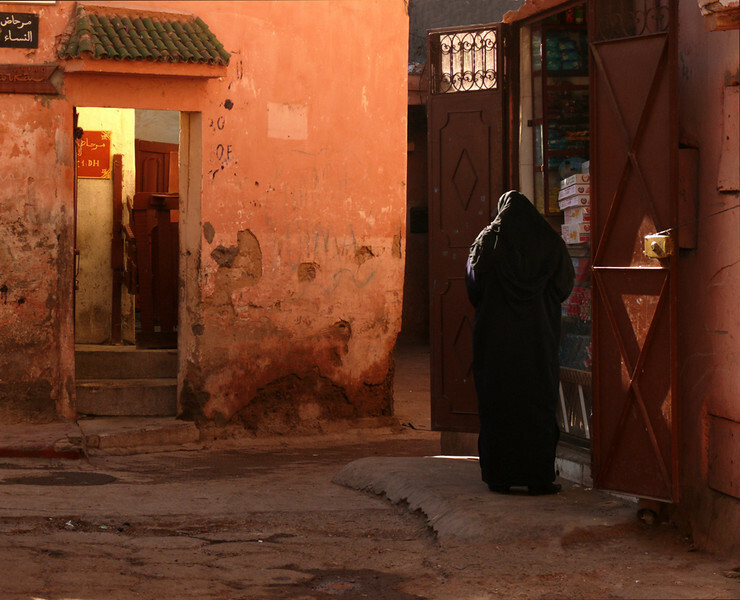 This image offers fitting closure to this exotic and fascinating photographic journey through Morocco.